Esperanza arrived to the farm June of 2018. She turned eleven years old on June 10th and shows great promise of becoming a master teacher for humans. She is one half Polish Arab and one half Friesian, with exceptional bloodlines. She came to the ranch because the woman who owned her was going to take her to a rescue and try to sell her. Kathy purchased Esperanza to prevent this from happening. Esperanza means “Little Hope” in Spanish. 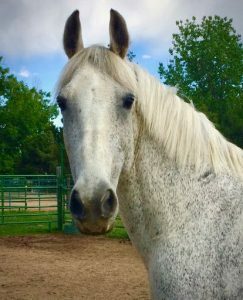 Kathy feels that she has finally called in her “White Horse Dancing” from one of her original Shamanic Journey’s with horse (ask about this story if you would like to read it). And when she reprinted her book, Hope from the Heart of Horses in soft back an image of a white horse was used (see book cover in left side bar). 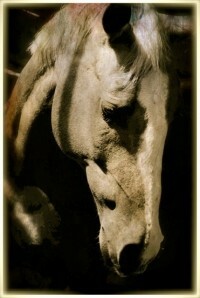 Now this beautiful horse is at the ranch. Esperanza lived on the same property her entire life, before coming to live with Kathy’s herd. She has been ridden and out on trail with only a rope halter and a treeless saddle. She is a highly sensitive horse, loves children, and is very willing to learn new things. She has a lot of energy, a big presence and can be bold. She offered a nice lift to her leg the first time Kathy asked for a Spanish walk and Kathy feels she will be an excellent horse for dancing. Her intelligence is off the charts. Kathy has experienced simply telling Esperanza out loud her expectations around moving around the ranch and coming in from the field and how to be at feeding time, and Esperanza willing follows verbal instructions. She can be calm, willing and friendly like a Friesian and also highly sensitive, intelligent, and reactive like an Arab. Her body is Friesian and her neck and head look more Arab. Deep inside is a warrior horse who knows she is lead mare and must be included in any herd in her desired position. She has very much taken to the work and is a brilliant mirror to the energy that one brings to her presence. Moon’s registered name is Flashy Doc Warrior. He acquired his nickname, Moon, after the pale color of the New Mexico moon, which shined the night he was born, and now appears in his caramel dappled coat. 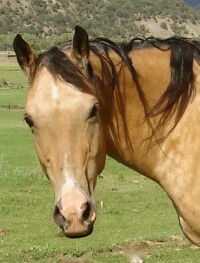 He is an AQHA registered Buckskin Quarter horse. He was a ranching horse and lived on over 200,000 acres. Unfortunately, Moon developed difficulty in his canter and could no longer perform in his demanding ranch job of gathering and sorting cows. His person, a female rancher, gave Moon to me. Moon is my first horse and has been with me for 12 years. Moon went through a lot of transition when he came to Colorado. He has stood beside me on my journey of bringing the Equine Facilitated Learning work into the world, has supported hundreds of my students and clients, and his picture is on the cover of my book, Hope from the Heart of Horses. He is a very sensitive and calm teacher. Often we find Moon licking and chewing and holding space for the entire group at a training or workshop. He has helped many people achieve deep levels of mind-body connection and integration through his shamanic style of work and intent awareness of energy fields. He also can be a prankster and enjoys pulling little antics to keep me on my toes. Moon often expresses a female energy not usually found in geldings. He is intuitive and holds a very deep-penetrating heart field. Moon’s presence is solid and profoundly soulful. He watches over the ranch, and it is seldom that I don’t see or sense him watching me. Moon is now twenty-three years old. He is the grandfather in the herd. A brown colt was born by a buckskin mother and brown father in the Pryor Mountains of Montana. 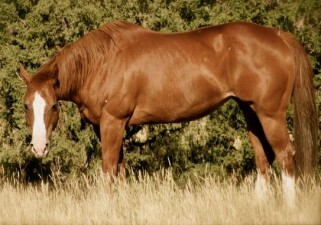 Ginger Kathrens, a cinematographer and creator of the Cloud: The Stallion of the Rockies series was first to meet this colt. 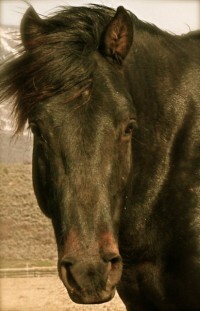 She photographed him being captured by the BLM as a yearling. He was then released with his mother and father back to the mountains to live wild and free. She named him Grizzly. You can find a picture of him in her book, running with his buckskin colored mother. Grizzly grew up and was known to be a loner and a bit evasive, seldom seen as he roamed the 36,000 acres of the Pryor Mountain range. When he was five years old the BLM decided to bait trap some of the horses of the Pryor Mountain herd. Using protein blocks to lure the horses in, Grizzly and a hand full of others were caught in the trap. That day they lost their freedom forever. He was gelded and placed in a holding facility to spend the rest of his life with many other horses, standing in a field with little to do. Ginger was able to convince the BLM that the five Pryor Mountain mustangs now in the holding facility would indeed be adopted if they gave her time. It was January of 2007 when I heard my inner voice saying several times: “What about the mustangs?” After the third time of hearing this I reached for the phone and called Ginger to see what I could do to support her cause. Ginger told me about the five mustangs she had just gotten out of the BLM holding facility and that were currently in the wild horse training program at the Canon City Prison. Before I knew it I heard myself say, “I’ll take one.” At the time I really knew nothing about training a horse, forget about a mustang, and forget about a mustang that was gelded late and displayed stallion like behaviors. To honor this horse’s Spanish Barb bloodlines and the land he came from I renamed him Corazon de la Montana (Heart of the Mountain). Little did I know how much heart he had to offer! The first year Corazon had distant eyes that searched the horizon for mountains and friends far to the north. Slowly, Corazon adjusted to his new life and became keenly curious about humans. This muscular and proud horse, once labeled as an un-trainable / un-rideable horse, has been ridden several times and partnered with a teenager for a full summer. He has a tremendous amount of “try” in him. With all that he has been through he now seeks to connect with humans. Corazon has become a master of taking clients on a journey between the worlds. He is a powerful horse and is fiercely free in spirit. He can be complex, challenging, yet gentle and kind. His has finely-tuned sensing capacities and a keen level of perception. He guides his students to clear the dark sides of predatory energy and to carry balanced power when working with him. He is responsive, light, a great dancer, and loves to be loved on. He carries wisdom of all of the ages; seeing and understanding consciousness at many levels. Corazon is now 12 years old. Shortly after I named Corazon, he told me that he thought his name, was a little too sweet. He told me he preferred to be called Cor (which means thief in Arabic and in French, love). Be careful if you play with Cor, his sweet nature will steal your heart! Diva is a 12-year old Chocolate (or Dirty) Palomino Paint. Diva originally was a brood mare. Her “diva” energy is best expressed in her beautiful flashy copper colored coat and blonde mane and the many variations of color in her four babies. When Diva came to me she was lame. It was unclear if her lameness issues were permanent or from poor farrier work. I took her onto the farm sensing that not only would she heal quickly but she also would bring in wonderful healing feminine energy to the herd and the programs. She has done both with ease and grace. Diva is one of the kindest horses I have experienced. She is very willing to try. She is calm in her mind and responds wonderfully to a soft feel. She is extremely friendly and loves physical contact. She loves to mother and has been watching the new filly (spring 2014) with great intent. Her ability to match and mirror human thought patterns is very pronounced. She is a master of offering exactly what one is thinking. When Diva is not sharing her feminine presence in the Coaching with Horses programs she enjoys a gallop through the fields or a stroll along the Colorado mountain trails. Her elegance and poise, while in motion or stillness, takes your breath away. Diva’s big heart and loving nature shines as brightly as her copper-penny coat and sunwashed blonde mane. Layla is five-year old registered AQHA Champagne Palomino Quarter horse. Her registered name is Play Girls Invasion. She has been at the ranch since late January of 2014. 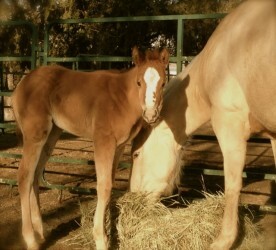 Just six weeks after arriving she gave birth to a filly, named Ginger, on March 11, 2014. Playgirl was hardly a name that I felt appropriate for my equine programs. For a month I talked with “Playgirl” about new names. Finally, she communicated to me she wanted to be called Layla. Layla means night beauty and is symbolic of fertility. In the night, her creamy white coat shines like rolling waves of silk. Her beauty is unusual with her diluted color. Layla is a strong and confident mare and very quickly established herself as the lead mare in the herd. At only five years old Layla has given birth to a total of three foals. Part of my promise to Layla is that she will be able to stay with her baby, Ginger. Now, she can rest from being a brood mare, have some time to grow up herself, and find her work in the world. I sense a great teacher in Layla with her extreme clarity, bold assertion, and deep desire to experience tender touch and respect from humans. Ginger is a fresh, bright, beam of pure light and consciousness. She came onto the earth on a warm red spring dawn. As the rays of light warmed her body she was bright firecracker red. It took her no time at all to get on all four legs and say, “hello world!” By afternoon she was confronted with a cold Colorado snowstorm. At only three months old she has shown signs of learning quickly, getting bored just as quick, and being very amiable to her human interactions. Ginger is curious, brave and very sweet. Her long legs and changing coat colors keeps everyone entertained. She is stunning and as with many fillies, one feels light buoyancy and joy in her presence. Ginger has already offered me, and the entire herd, a new experience as the herd shifted into a deeper sense of “family” with her arrival. She currently is just a baby and is not yet part of the official teaching staff. As she matures she will be an amazing guide to help others ride between the worlds, expand their consciousness and access new levels kindness and love. Dizzi is a 24 year-old Quarter Horse. Her registered name is Ima Out of Focus, and she was born in Kansas in 1991. Her color is sorrel with a white blaze on her face and white stockings on her hind legs. She was bred once and foaled a colt. She was trained in Western disciplines and has done some reining, trail obstacles and trail riding until she was about 12 years old. Dizzi has had some physical challenges in the last 8 years. She retired from riding about 5 years ago when she fell in the arena when her owner was riding her. Here at my farm she has become a valuable member of the teaching herd. “Healer” is the best word to describe Dizzy. She works deeply with humans to help them be with emotions, holding them in a safe space with sincere gentleness. She is highly sensitive to touch and likes to have lots of space. When she first arrived I, nor anyone else, could not walk up to Dizzy without her walking away. About a year later and after we moved to the farm in Berthoud, one day I was out feeding the horses. Dizzi walked directly up to me and I heard in my mind the question: “Can I die here?” At first I was shocked. I then asked her if she was planning to die soon. Then, I came to understand that she wanted my herd and my home to be her’s too; she wanted this to be her last stop. Of course I said “yes” to this beautiful sorrel mare. Since that day, Dizzi now approaches me, will come to me so I can put on her fly mask, and is receiving more and more physical touch and love from others. She is our Red Horse, and brings with her the wisdom of a grandmother and the deep understanding of the many complexities of relationships and life. In 2016 we lost Dizzy as she traveled on to the Spirit Land. We still feel her presence here on the farm and give deep gratitude to her for all of the human hearts she healed and opened. 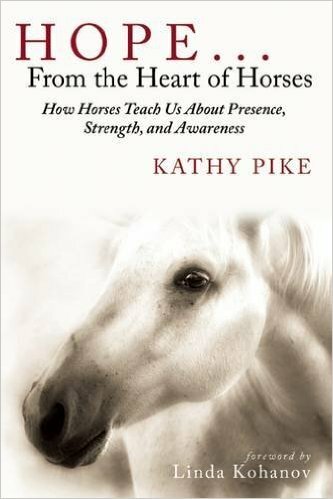 Author Kathy Pike is dedicated to uplifting human consciousness to bring love, honor and respect to horses and all creatures, humankind, and mother earth.